Just replaced my timng belt and now putting the drive belts back in place. 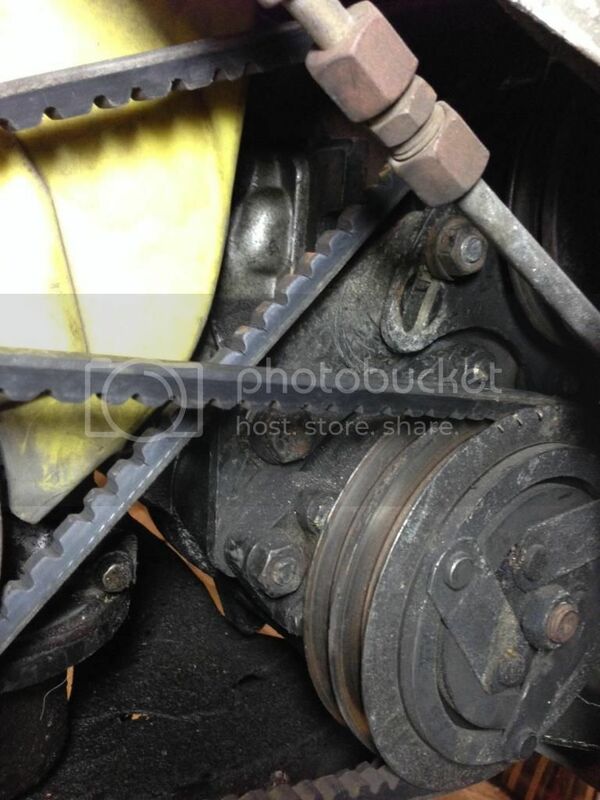 Can not figure out how you're supposed to tension the 'middle' belt that drives power steering. I got the alternator/water pump ('top') belt and the air conditioner compressor ('bottom') belt tensioned about right but I can not figure out how to take out the slack in the power steering. In the photo, you can see the bottom A/C bracket and the power steering adjustment nut (I think it's also the pivot stud for the A/C bracket). I can pry up on the adjustment flange but it just doesn't move enough - it needs to slide to the adjuster's end. Or is that how it's done? I always tension the belt in such a way that the belt bends between the two pulleys about 1cm under my finger. To increase the tension I use a lever placed between the alternator and engine. This should be fine also in your case with AC compressor.. Turns out that the power steering pump has a vertical rod to control the tension. A square nut on top moves it until the lower adjustment stud/nut can be secured. Yes, you can use a lever to move the A/C compressor and tension it, but the power steering has a different mechanism. Not sure if this only applies to later model with A/C; perhaps if there's no A/C there's no need for the vertical rod, as you can get a lever on it directly. Sure wish my shop manual had late model info in it!